In a corner of the living room is a Japanese screen which dates from the late 16 th century and depicts the Imperial horse stables. The carpet is late 17 th century Chinese and the pair of Huanghuali horseshoe back chairs are part of a set of four 17 th century pieces. 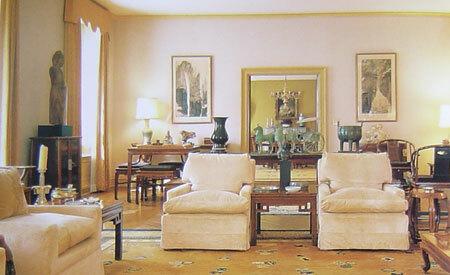 Clean lines, lack of ornamentation and a subtle colour scheme characterize Kai-Yin Lo's living room, where Chinese art is hung on the walls with architectural precsion. A pair of window panels features the persimmon in a four-petal design. "One of the earliest plant motifs used in China, the persimmon dates more than 1,800 years to the Han dynasty," she says. On a Ming side table at the back of the room is a pot filled with 200-year-old fungus called Lingzhi found in Anhui province. Looking through the living room into the Dining room , flanking the door is a pair of mountain landscapes by Fu Bao Shih, 1940. 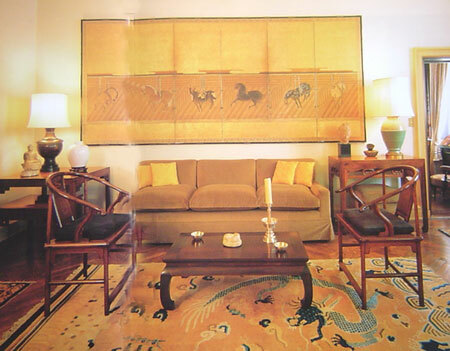 The large figure on the left is 12 th century Japanese, the Chinese carpet is late 17 th century / early 18 th century. The barrel stool in the foreground is made of Laohuali, a style of rosewood. Such stools were originally made of bamboo, hence their shape. The top is marble - "Very good as it doesn't leave stains when people pry their drinks down on them", notes the owner. A pair of sofas dressed in pale textured fabrics stand in the center of Kai-Yin Lo's living room, defining the seating area in the flowing, open plan space. 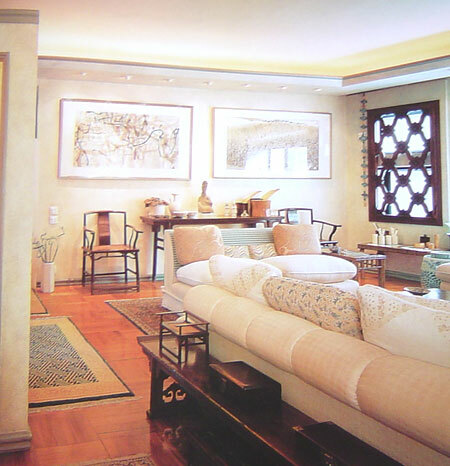 Recessed and spot lighting illuminate her extensive collection of Chinese art and furniture. 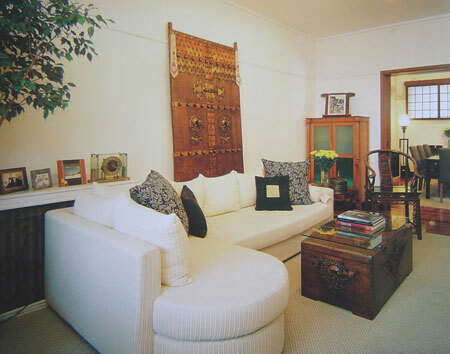 A low platform functions as a coffee table; it was originally one of the earliest types of raised seating in China. This rare piece dates from the 18 th century and is made of nan mu (a variety of cedarwood). It is constructed of three modular sections which can function as a single platform (pictured here), or used separately as smaller seats, stands or low tables. On top is a miniature Ming display table featuring a collection of Buddhist knots of destiny. A silk padded screen, featuring artworks in ink and colour, shields the dining room from the living area. A 3 rd -century Gandhara Buddha from the Indus Valley stands serenely in the entrance hall. 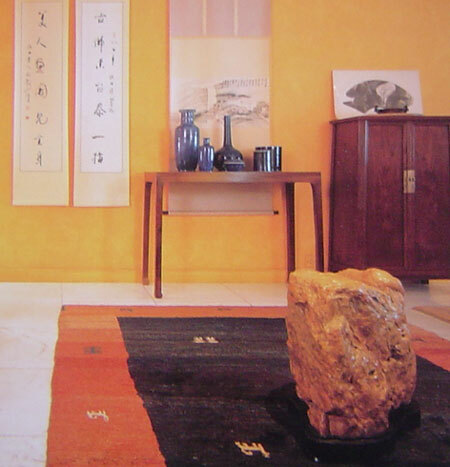 "Rocks are treasured by Chinese collectors as objects of art," explains Wu. "They symbolize nature and can be brought inside so one can contemplate nature indoors." This malachite stone from Shilu Mountain is an impressive example. A classic 16th-century Ming lute table stands against the far wall; it would have been an important part of the scholar's accoutrements of the time. Calligraphy is regarded as the highest form of art in China and Wu Bruce has a spectacular collection. Hanging behind the lute table is a 16 th -17 th -century scroll by Zheng Da Qian which depicts the lone scholar in the mountains. 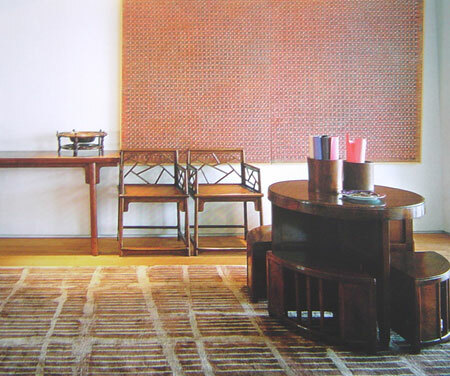 The pair of calligraphy couplets are by early 20 th -century calligrapher Lin San Zhi; they refer to furniture. 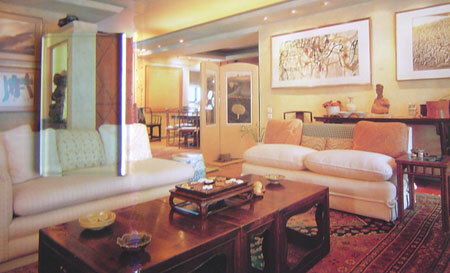 In the foreground, a dash of contemporary style is added with colourful Iranian rugs. The extremely heavy yellow wax 'Lashi' stone symbolizes nature being brought inside. Floor-to-ceiling glass panels overlooking a central stairway help open up the interior of this four-storey London house. 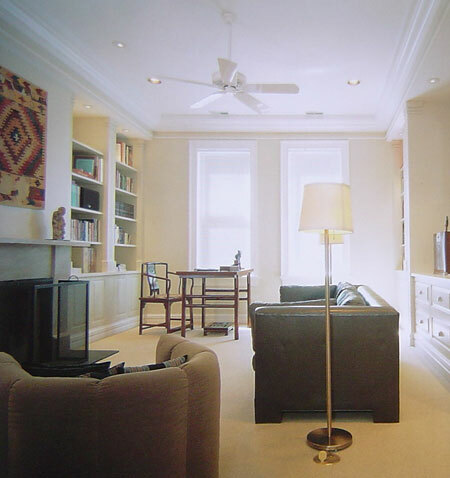 In the living room, things are kept architecturally minimal with white walls, a pale wood floor and spot lighting. 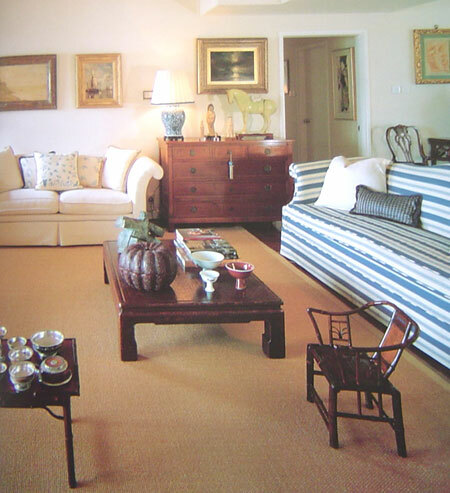 The clean-lined approach is maintained with select pieces of pared-down antique furniture. 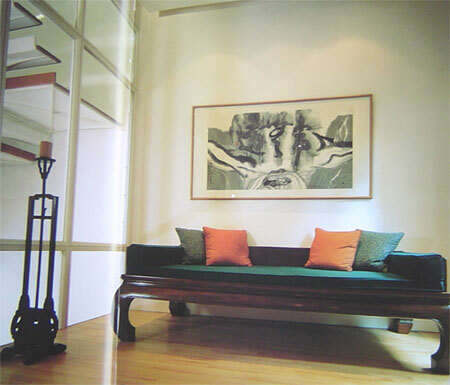 A Ming luohan chuang (couch bed)-which would have originally been used for relaxation, meditation or conversation, often moved onto a terrace or into a garden to enjoy nature from-stands against the rear wall; to the left is a carved candlestand. In the library, a 19th-century Anatolian kilim hangs on the wall; to the rear is a 17th-century Huanghuali painting table and a 16th-17th-century southern official's armchair. 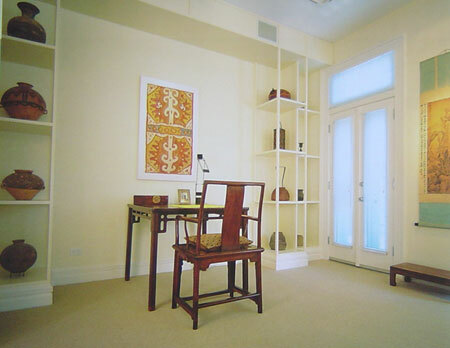 In the foreground, and Elmwood and red lacquer 19th-century ladder rests against the bookcases. The occupants prize the form of the furniture over the media used to create it as the most important feature in their collection. Carol Lu elegantly installed classic, clean-lined Ming furniture within a quasi-industrial palette in her light and airy Hong Kong apartment. In the entranceway, the concrete floor is tactile, durable and childproof. A sliding oak door seals off the space that features a burgundy back wall, a spindleback chair and a huge atmospheric canvas by Paris-based artist Zao Wuki. White walls, a striped cream sofa and beige carpeting form the backdrop to a collection of Chinese antiques in the living room. With a nod to practicality, Chang added a glass top to an old wooden trunk engraved with country scenes. Against the wall stands a pair of Qing dynasty wod and brass doors from Shanxi province; near the sliding doors to the dining room is a 1930s cabinet which demonstrates the mix of Western and Chinese elements characteristic of the time. The glass in the bottom section is original. A mix of custom-made Western-furniture, Chinese antiques and vibrant contemporary Chinese artworks produce Shanghai chic with an international edge. Shanghai's art scene is still in its infancy and Chua has selected work by prominent Chinese artists that, at present, are making more of an impact on the global scene than at home in China. 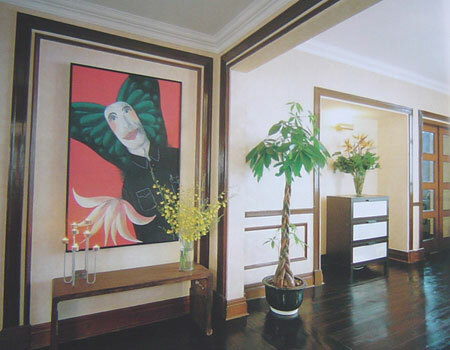 In the entrance hall hangs a dramatic work by Shen Fan, untitled, 1995. In the living room of Brad Davis and Janis Provisor's apartment, a seepskin throw is draped over a pistachio green sofa; a 1940s chair is covered with leopard-skin print fabric and an Isamu Noguchi lamp stands in the corner. 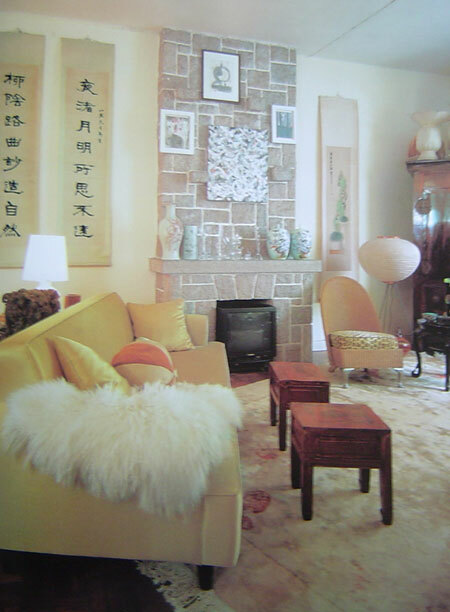 Hanging above the brick fireplaceis a watercolour by Janis Provisor; on the mantelpiece is a collection of Italian glassware from the 1950s alongside antique Chinese jars and vases. On the wall hangs a pair of calligraphy scrolls. 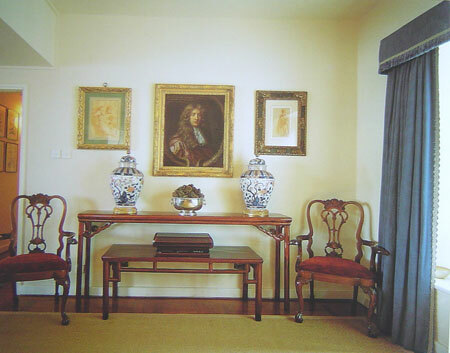 Against the dining room walls stands a pair of mahogany Chippendale chairs. Between them is a slim 18th-century Elmwood sidetable from Shanxi province; on top is a pair of baluster vases, decorated in underglaze blue with polychrome enamels in the Chinese Imari style of the 17th century. The portait is of Viscount Wenman, painted in 1680 by Mary Beale, one of the few female artists of the period. In the living room, a rare 18th-century child's horseshoe backed armchair made entirely of bamboo stands next to a 16 th -centruy Ming Kang table covered in woven bamboo and lacquered in red over black. In the foreground is a low table displaying 18th - and 19th-century Tibetan silver bowls. The Tang horse is a fine example in apple green glaze, with its original unglazed saddle.